WS.WebTV: Adding a Template (Advanced Customization). Instructions on how to add a Templates in WS.WebTV. A Temaplte is a HTML file which contains the structure of a page (Video Channel, Text Channel -Page-, Clips, Categories, News, Events, etc.). It is possible to add templates for Clips, Channels, Pages, Categories, News and Events. The following items allows you to assign different templates individually (by editing the desired item and selecting the template): Channels, Pages, Categories, News and Events. Additionally, you can globally override the templates (from Configuration > Appearance) used on: Clips, Channels and Pages, Categories, News and Events. 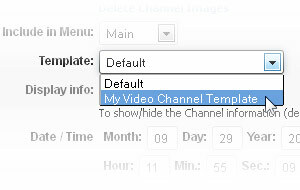 For the example we will add a new Video Channel template we will identify as "My Video Channel Template". "my_video_channel_template": is the Template ID. It must not contain any space or special characters. "enable_widgets": Options 0/1. To enable/disable Widgets on the Template. "file": Is the HTML template used on the "Desktop" interface. "file_mobile": Is the HTML template used on the "Mobile" interface. Tip: For the template files, you can start from one of the existing ones: duplicate the file you want to use as "starting point", and rename it according to what you have entered in the _themes.ini file. Note: Since the JSON format is very strict, we recommend you to validate the file after performing any modification to it. In order to do this you can use an online validation tool like these. After publishing the file, when creating or editing a Video Channel, the new template will appear in the Template dropdown. 4. Edit your template files and publish them.